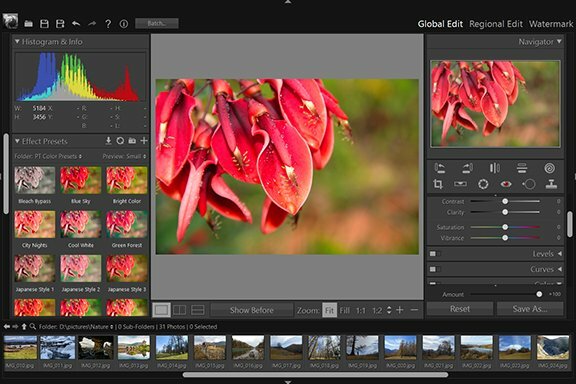 Red Eye Correction Tool - Global Edit - User Guide of PT Photo Editor - Easily rescue problem photos. Make every shot its best. Red eye in photos is a common problem. 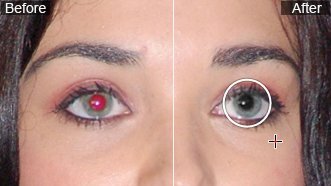 When light from the camera’s flash reflects off the retina of a photo subject, a red eye effect is captured in the photo. The Red Eye Correction tool lets you remove the red eye effect in the eyes of the subjects in your photo. Select the Red Eye Correction tool in the tool strip or press "E". Drag the "Pupil Size" slider to increase or decrease the size of the area corrected. Drag the "Darken slider" to the left to reduce the darkness of the pupil area corrected. To change the selection size, drag the handle on the circle. To reposition the correcting area, drag in the circle. To remove one red eye change, select the red eye circle and press "Delete". Click "Apply" in the panel to complete the correction.